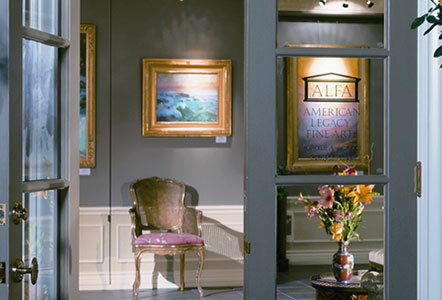 American Legacy Fine Arts represents only the finest contemporary-traditional painters and sculptors, including nationally-recognized award-winning artists as well as historic American art. This diverse group of artists provides our clients, beginning and established art collectors, with the opportunity to select perfect works of original art that will enhance their private and public collections. Our artists utilize classical and realist techniques in contemporary context and are among the finest plein air, landscape, still life, figure, urban, and genre painters and sculptors in the world. California Art Club, National Sculpture Society, Plein Air Painters of America, Oil Painters of America, and Portuguese Bend Art Colony. ALFA specializes in personal service, including private art consultations and commissions as well as monumental sculpture installations and civic art projects. Our clients include museums and public institutions, renowned art consultants, interior designers, and architects. The art gallery is located in Pasadena, California just minutes from Downtown Los Angeles and is situated in a tranquil neighborhood near the Rose Bowl Stadium, Gamble House, and Norton Simon Museum. To provide our clients with utmost service, we are open by private appointment, Tuesday through Friday from 10 a.m. to 6 p.m. and Saturday from 11 a.m. to 5 p.m. Please call (626) 577-7733 to make your personal appointment and to receive directions to the gallery. "A very positive atmosphere for considering and viewing excellent California plein air art. About as ideal as one can imagine. Elaine Adams is a welcome source for enjoying all the displayed art. Eventually, my wife and I did buy a painting (it was our second visit.) We are thankful that we did."